Kirby's mobile phone needs updating. Now we're hearing rumours of two more titles to be added to the line-up: Kirby and the Amazing Mirror and Super Mario Bros. 3: Super Mario Advance 4, according to a Nintendo customer service representative. While we've not heard anything else about Kirby, Super Mario Bros. 3 has also been mentioned by Official Nintendo Magazine, which would seemingly confirm the classic adventure is coming to 3DS. It's worth taking this with a pinch of salt as always, but would you be happy with Kirby's incredible reflective surface on 3DS? Thanks to BD for sending this in. Kirby would be great, but I'm hoping for more variety like Golden Sun or Final Fantasy Tactics Advance. Maybe even the Zeldas, Metroid: Zero Mission, Mario Golf (loved the RPG elements), Advance Wars, or the Castlevanias would be welcomed in my book. I'd say there's no way you 3DS owners can expect anything else then first and second party games. Capcom, Square Enix and Konami has got nothing to do with Nintendo's failure... Or do they? Again, if GBA games on the 3DS have a stretched(as in blurry) or tinier screen than how GBA games would look on a DS lite, than I could care less. If this is in fact that case, instead i'll just be getting the actual GBA games off of eBay and play them on my DS Lite. PS: The Kirby Box art looks gorgeous! Me too NetrackSteven64. Man I hope that game shows up in the batch. I want Pokemon Silver and Super Mario World! Make it happen Nintendo! Both games I had as a kid but never finished (the first because the infamous "Save battery" died and the second because of the difficulty). Kirby and The Amazing Mirror. Sounds interesting enough. And YES! Super Mario Bros 3! But I was expecting it anyway, but It's great news. I thought if anything we'd get the NES version of Super Mario Bros. 3, so to find out we're getting the GBA version is sweet music to my raccoon ears. I've already played this, but I liek'd it, so I guess I'm hoping for it come out, along with Superstar Saga of course. By the way, is there a way to let Nintendo see our thoughts? I feel kind of mixed when I hear about all the GBA games, cause I've felt like "Oh, that'd be great! I never played that one." for almost ALL of the first party GBA games. Feels like I missed out on quite a lot of games during the GBA era. I guess it's good now since I'll be getting most of them. But still. Don't think I've ever heard of this Kirby game. Unexpected is good (I think). Is it like most Kirbys? SMB 3 GBA doesn't make much sense to me, though. SMB 3 as an NES Ambassador offering & Super Mario World GBA. Seems to cover more bases. But I know beggars can't be choosers and I appreciate the free games. Wonder if Nintendo releasing Yoshi's Island this way means no Yoshi's Island on Wii VC? This Kirby game is kinda like the Metroid kind of games as in there's a huge... place to play in. I didn't like this one much. I found it confusing and not as fun as Nightmare in Dreamland. Besides, this was the last Kirby to come out before the uber-creative (and the one that kickstarted my interest in Kirby games again) Kirby's Cursed Canvas for DS. I am absolutely interested in playing Capcom's Kirby game (because Flagship did this one, if I'm not mistaken). i would also like Nintendo to release Flagship's Zelda games on the VC (Minish Cap, the Oracle saga). Never played either of these so I'm happy. I'm not surprised either, I predicted both of these games. (Which leaves Donkey Kong Country (probably 3), Wario Land 4 and Legend of Zelda: Minish Cap for my remaining 3 predictions. Can you play Amazing Mirror in singler player? Is it any good in singler player? I never played Amazing Mirror, so bring it! Ah, I have so many good memories of BOTH those games and I would definitely love to replay them both on my 3DS! Hopefully they are coming! @dizzard I thought that too, but Nintendo itself says Yoshi's Island is coming. Maybe we're getting both? I'd rather have the NES version of Super Mario Bros. 3 so they can include original GBA games like Minish Cap! Never played this particular Kirby tirle but I have heard that its one of this better titles and I am a fan of the pink blob's games - hence insta-download IF it comes our way. ive never played it so ill take it gladly.off topic i finished riskys revenge yesterday and on the credits thankyou list it said nintendo life was that because of help with advertising the game? That's not exactly what I meant, regardless of what Nintendo has said. (we know super mario advance 3 is announced) but the official nintendo magazine might have put down the wrong game....why else would super mario advance be left out of the list? So Nintendo might have told them super mario advance 3, but for some reason they put down super mario advance 4 instead. So if we really are getting SMA4 and a Kirby game (not the one I was hoping for, mind), does that mean the other three titles are the rest of the SMA titles and M&L:SS? You know, I've been pretty lucky with this selection so far. There are exactly 10 GBA games that I don't have but would like to, and so far 6 (possibly) of those have turned up on the list. Well, this would make three titles that I don't already own. I'd rather they put SMB3 on the NES side so they had more GBA originals. The only reason I was fine with Yoshi's Island was because they weren't doing SNES games; but, Kirby's a wonderful addition to this. Haven't gotten to play this Kirby yet, so it would be a welcome addition. I wonder if the e-Reader levels of SMA4:SMB3 would be accessible? If SMA4 does come out they better find a way to put the e-reader levels on it. I would love to play the Kirby game. It would be funny if Kirby's phone got hacked during gameplay. i really hope super mario bros 3 is coming! Please give us Fire Emblem as well Nintendo. This is good news but still as someone else said, some variety please. I have already sold my Kirby AM so this is good news for me. Still waiting for the fisrt Mario & Luigi on the list. And Minish Cap. 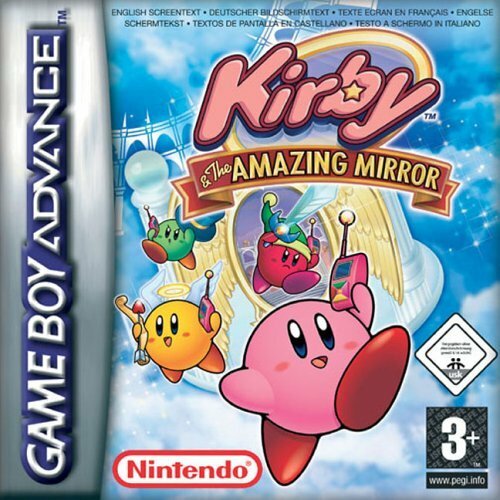 Amazing Mirror is ab utterly overlooked Kirby game. One of the most enjoyable games in the series. It's kinda like other Kirby games but mixed with a little bit of Metroid. Anyway, I'm expecting Minish Cap. e-Reader support would be great. If they do add support, I would also like to see the cards that were only released in Japan and never made it here. Also, since everyone keeps saying Minish Cap, let me say, "No Minish Cap in the initial 10 please." I feel that it lacks the magic that the Nintendo developed Zeldas seem to have. A Je ne sais quoi if you will. OMG! I forgot about K&TAM! As for SMA4, YHAY! Hopefully this is true. Now for M&L: SSS, Super Mario World, and Minish Cap. Please, Nintendo. My favorite Kirby game. I would definitely like to see more people get a chance to play it. Zelda Minish Cap, Metroid Zero Mission and Drill Dozer, please. Ah come on. Don't give us lame-o SMB3. Superstar Saga, Minish Cap, and Fire Emblem! I really wanted Amazing Mirror and SMB 3, so please let this be true. I've not played this one and think it would be pretty sweet if we saw this, Mario & Luigi: Superstar Saga and The Legend of Zelda: Minish Cap on this list. Nintendo is making some strides toward digital services and hopefully they continue to make this a marketable branch of the company, with cheaper games and more content available in the near and foreseeable future. @16 John-John - I love your avatar! I've never played any GBA or NES games, so anything we get will be new to me, but it would be nice to get a Pokemon game somewhere in the selection, please Nintendo. Favorite Kirby game has made it in! Now if we get Minish Cap and F-Zero, I might explode! I've still just got my dragon-y fingers crossed for FIRE EMBLEM. Personally i'd like Kirby: Nightmare in Dreamland more because i've already got Amazing Mirror. But it should still be a great game to get. I only hope Yoshi's Island: Super Mario Advance 3 will still be present and they didn't just mistake it for Super Mario Bros. 3: Super Mario Advance 4. And as much sense as some release of Super Mario Bros. 3 makes i would rather have seen it as a 3D Classic. Which maybe wouldn't be too good of an idea and it could be i'm just overhyped for it. Damn, that list just keeps getting better! If they do have kirby I hope they have wifi multiplayer. I played the apple juice out of this game. Anyone like the SMASH ability? Oh my Gawd, please be true! Those games are too expensive to get ahold of as carts! ^What could possibly be better than Metroidvania Kirby? Still want Twisted! and M&L:SS. I never got the chance to play Amazing Mirror, so please let this rumor be true! @65, exactly why I loved that game, haha. Kirby I welcome, since I've never played this one, but I hope there won't be too many more platformers. @69 But platformers are Nintendo's specialty! There aren't that many more first-party games that Nintendo can give us that aren't platformers. Ugh! Am I the only one who doesn't like the GBA version of SMB3? I'd rather get the NES version, then get some original GBA games. M & L: SSS, Advance Wars, Drill Dozer, and Wario Land 4, and Minish Cap would round out this list nicely. If e-Reader functionality somehow makes it into SMB3 in one way or another, that would be amazing. Otherwise, I don't care. Kirby! I love Amazing Mirror! Now I just hope that they'll do multiplayer available too but that's just too much to hope for. For the SMB3 GBA, I just have to say: "Why?" SMB3 is a good game but I don't want it to take a place from those 5 unconfirmed titles. There's much better games for GBA, I'd be fine if it would've been for NES but as there's other games like M&L:SSS, KH:CoM, FFTA, Pokémon, Minish Cap, Fire Emblem, Wario Land 4, Advance Wars and Bomberman Tournament that weren't on NES, I would've more likely given the place SMB3 took for one of these games. @TheDarkness: You aren't the only one. Am I right in thinking Amazing mirror is kirby gone metroidvania? If so, sounds saweeet. That woudln't be bad. Although, four Mario games seems to be overkill. Love Mario though I do, I'd like to see them show other franchises some love. Kirby's good. How about Pokémon FireRed? Golden Sun? EarthBound 3 (Mother 3 to you purists)? Drill Dozer (great game)? Unless... could those GBA games be coming available to the general public, but the ones in the ambassador's program would be exclusive for the time being? That way Kirby and Mario would still be coming out, but not necessarily be the Ambassador Program games? Ah, I remember this game I played it on my GBA SP all the time... until they were both stolen. Anyways I'm hoping for Advanced Wars 1 the most! @75: It's Kirby gone Metroidvania by way of the Four Swords. I'm just wondering if they are going to put in the 4 player multiplayer? I'm guessing they might because it's from the same company that made Four Swords, which can only be played multiplayer, and is also gonna be released for free. That would deffinatly increase the value in the game if they added the mutliplayer. And please, let it be enhanced for multiplayer- possibly even online! I dint even know what to think about this statement. "To you purists"? What does that even mean? The title is Mother 3, not Earthbound 3 (which doesn't exist). If anything, it would be Earthbound 2. Get your facts straight. I'm hoping SMB3 makes it! WOo-Hoo! Kirby and the Amazing Mirror...don't even bother unless you put game link cable support in, guys. Of course, I feel the same way about Mario Kart Super Circuit, and really games in general...grumble grumble. The line-up sounds pretty sweet, can't wait to see what else is in store for us loyal fans that bought the 3DS early. @80 @76 I like how the person who found fault with the "purists" comment is clearly a massive purist. To put it politely. Super Mario Advance 4 will be awesome, but it has to have the E-Reader levels and the cards for Vegetables and Fire Flower into coins turned on. That wasn't "politely" but I'll let it slide. What is a "purist" and what does it have to do with anything? I got an email confirming the same thing. It also confirmed that the gba games are free but it's undecided whether there will be more than twenty games total to choose from. I say YES to the Kirby game, If it also will be available for me in the future! I have just a little complaint about Kirby's mobile phone (just a little). I always found it strange that Kirby used a mobile phone in that game. That's just not fantasy-like! Taking all things into consideration, I'd say that the last three we can expect will be Superstar Saga, Minish Cap and an Advance Wars Game - I hope its the first since I had the second, but still I haven't played any of the 7 that are announced yet, nor any of my predictions, so I wouldnt really mind. Also, this is my first comment on nintendo life, since I signed up today! I checked the Official Nintendo Magazine online article on this, and it seems that European Ambassadors are getting different games from the American ones. Take my words with a grain of salt. I just loved this game on GBA! Really liked how it was more exploration based! @waveboy GBA screen are widescreen so itll be blurry but at least itll take up the entire screen. @C-Olimar: Welcome to Nintendo Life! If they do have kirby I hope they have wifi multiplayer. Feel the same way as you guys. I never played Kirby's Amazing Mirror so this will be great news to me. As for SMB3 I'm somewhat disappointed since I already own the NES (the original cartridge version), SNES (The All stars + Super Mario World version) and the GBA version. Still it would be great to play it without the need of the cartridge. @ Crunchy_in_milk I agree; however; Nintendo may have plans to do something for Super Mario Bros. 3: Super Mario Advance 4 such as adding DLC and extras for the game in the future but yeah if they're not doing anything with the game then the NES version was a better choice so more GBA titles could be release instead. Like some others said, I really hope for some wireless multiplayer support on this one. Multiplayer was so much fun in this game. KIRBY AND THE AMAZING MIRROR!!!!!!!!!!!!!!!!!!!!!!!!!!!! I love that game!!! i hope your not getting my hopes up for nothing! @James do you think we'd get a harvest moon game? I dont need another copy of SMB3 I already have the original somewhere in my house and have the game for the GBA already AND I also have the All Stars edition for Wii which is essentially the same thing as the SNES version.